COFFEEMAKERS or coffee machines are cooking appliances used to brew coffee. While there are many different types of coffeemakers using a number of different brewing principles, in the most common devices, coffee grounds are placed in a paper or metal filter inside a funnel, which is set over a glass or ceramic coffee pot, a cooking pot in the kettle family. Cold water is poured into a separate chamber, which is then heated up to the boiling point, and directed into the funnel. 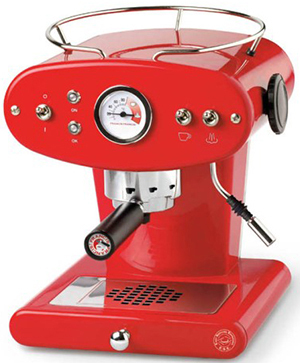 8 BEST LATTE & CAPPUCCINO MACHINES - Wired. 19 Select High-End Coffee Makers for the Perfect Cup of Joe - decoist. best cheap coffee maker - engadget. best drip coffee maker - engadget. Coffeemaker buying guide - ConsumerReports. Drip Coffee Maker Reviews - Let's Drip Some Coffee. 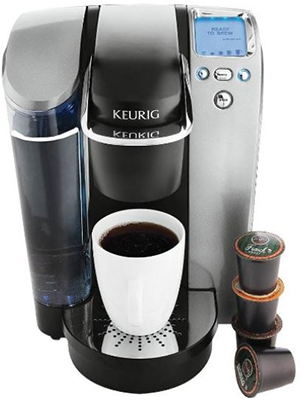 KEURIG K-CAFÉ review - "The original pod coffee company has created an ace latte & cappuccino machine." Moka pot, machine, filter or instant - which produces the best coffee? - "The company behind the iconic Italian stovetop gadget is in financial difficulties – is that because there are now better ways of making coffee? We put the most popular methods to the test." Mug That Makes Everyone a Barista - The New York Times. Multi-ccino Mug - "The Mug That Makes Everyone a Barista." 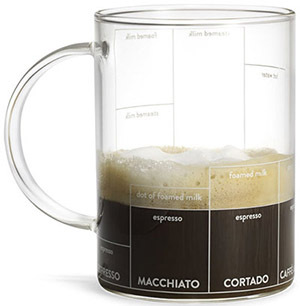 This borosilicate glass mug invites coffee drinkers to learn and create various recipes. Measure ingredients and change the proportions of espresso, milk and water using the handy indicators printed on the outside of the mug. Recipes include espresso, macchiato, cortado, caffé au lait, Americano, flat white and cappuccino. 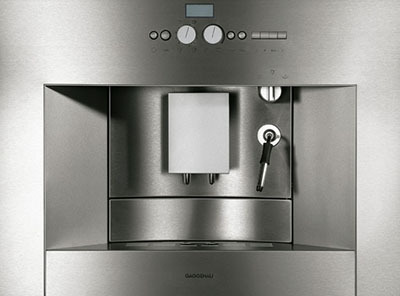 The best coffee machines - The Telegraph. The ultimate guide for choosing the best coffee machine - Love your coffee. 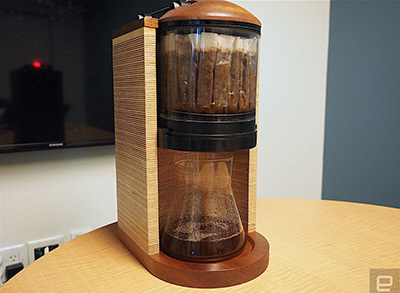 Vacuum coffee maker - brew coffee using two chambers where vapor pressure and vacuum produce coffee. 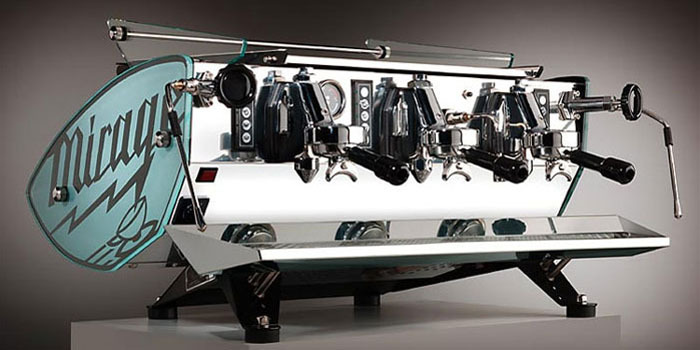 Vertuo coffee machine – a haughty home barrista - The Guardian. 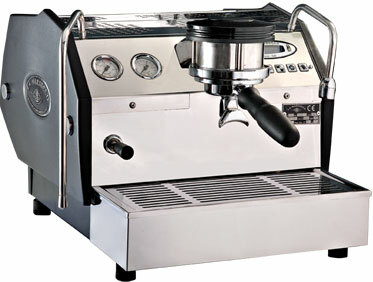 AEG COFFEE MAKERS - espresso coffee machines. AJ PRESS COFFEE MAKER - design by Danish designer Arne Jacobsen. ALFI - "Designed to Perfection." Also thermal coffee carafes, stainless steel thermos. 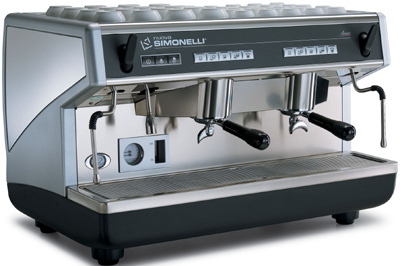 ASCASO COFFEE MACHINES - all models. "Barista quality at home." 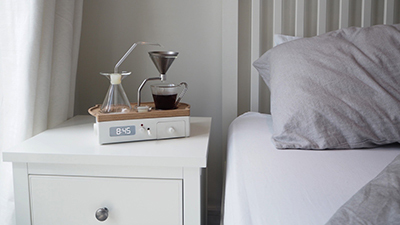 Barisieur's coffee-brewing alarm clock might actually happen - engadget. 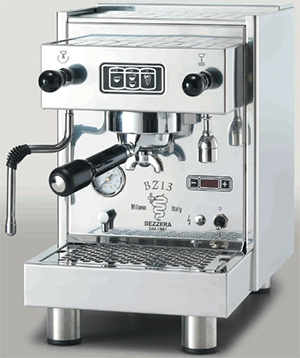 BEZZERA - since 1901. Made in Italy. 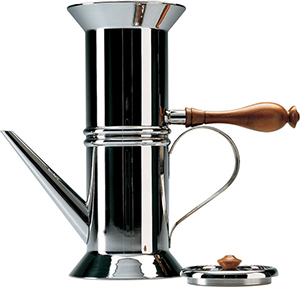 BIALETTI - moka & coffee makers. 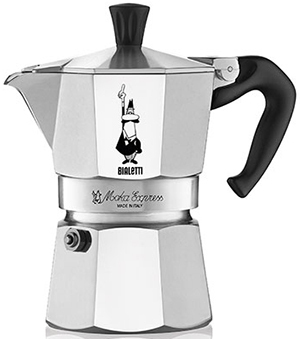 The classic Italian coffee percolater: Moka Express. Blossom One Brewer - "Precision Coffee Brewing." The Blossom Brewer is like a sous vide for coffee—it maintains a single temperature for any length of time, accurate within a single degree Fahrenheit. Single temperature brewing removes bitterness caused by high temperature peaks and sourness from cooler temperature lows, giving you powerful control to dial in specific flavors. BODUM - "make taste, not waste." Bonavita - all coffee brewers. BRAUN COFFEEMAKERS - all models. Bunn - "We make the coffee makers that make great moments." 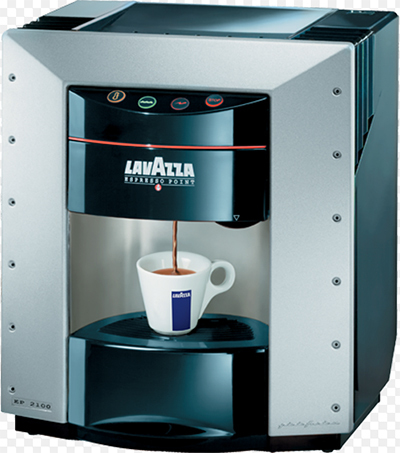 Commercial & home coffee makers. CAPRESSO - "Become a Barista!" 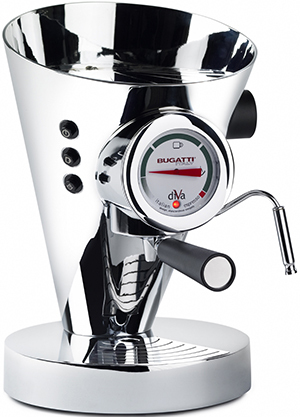 CASA BUGATTI - Diva espresso coffee machine. Chemex - "Pure Design. Pure Flavor." COFFEEMAKERS AT AMAZON.COM - as October 20, 2015: 93,892 results. CUISINART - "Savor The Good Life." All models. DE'LONGHI COFFEE MACHINES - all models. 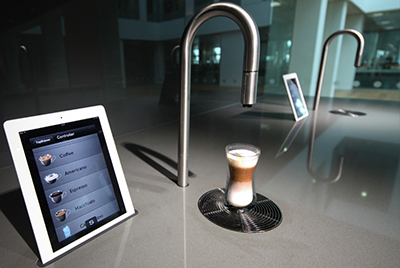 DUALIT ESPRESSIVO - "A barista for your kitchen." FRANCIS FRANCIS ESPRESSO MACHINES - all machines. FREVD ESPRESSO COFFEE MAKERS - since 1986. Stovetop Espresso. GAGGENAU - founded in 1683. Restaurant-grade appliances for your kitchen. 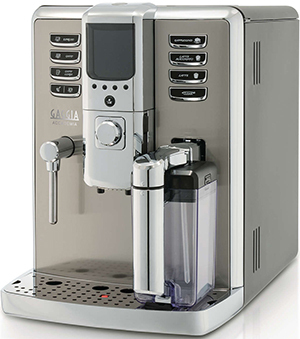 GAGGIA - Italian coffee machines, espresso and cappuccino machines. Grower's Cup - "Freshly Brewed Anywhere, Anytime." 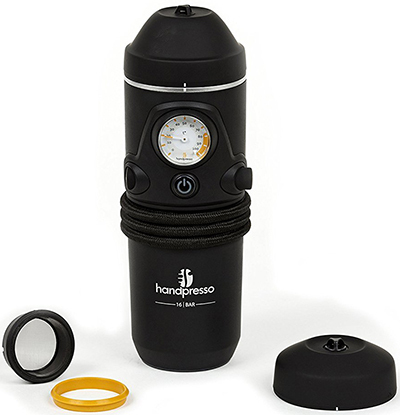 HANDPRESSO - "Portable espresso...anywhere!" 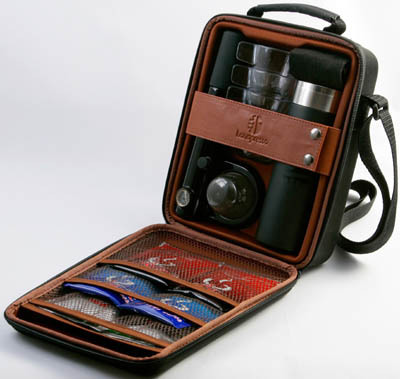 Portable espresso mashine, car and travel espresso maker. Handpresso 12V Auto Hybrid - plugs into the cigarette lighter in your car to and brews a piping hot espresso right there from the cup holder. 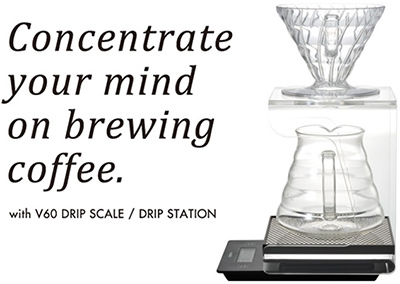 Hario V60 Metal Drip Scale & Drip Station - "Concentrate your mind on brewing coffee." Reap the rewards with Hario drip station - an all-in-one brewing set-up which includes a coffee dripper, coffee server, V60 stand and V60 scales. JURA COFFEE MACHINES - all models. JURA IMPRESSA F50 Classic - "Thanks to four programmable preparation buttons and improved user guidance with the Rotary Switch, it has never been easier to create the perfect coffee. Decide how you want your coffee and fall under the spell of the amber cup illumination during its preparation." Kees van der Westen - espresso machines. Keurig - since 1998. "World-wide industry leader in single-cup coffee brewing technology." Kitchen Aid - all models. KRUPS - "Beyond reason." World of coffee. All models. 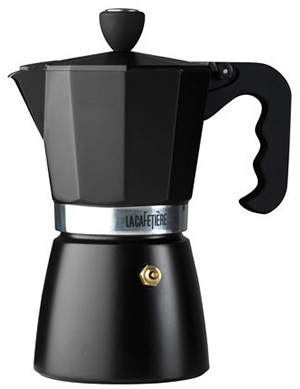 LA CAFETIÈRE COFFEE MAKERS - "French Press Coffee Machines, Espresso & Cappuccino Makers." 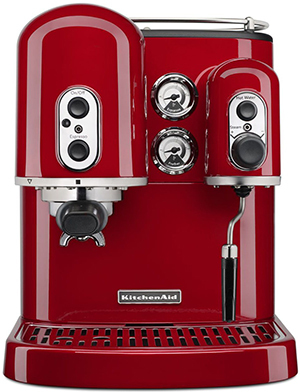 Offers the coffee connoisseur the opportunity to create a barista style culture in the home. 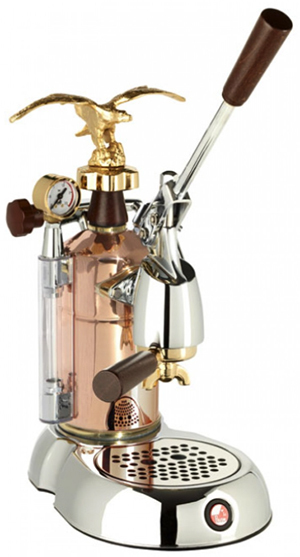 LA MARZOCCO - "For The Serious Barista." Espresso machines handmade in Florence since 1927. "The Ferrari of coffee makers." LA PAVONI - since 1905. "Lever Machines, Combined Machines, Dual Boiler Machines & Pump Machines." Lavazza - "Enjoy authentic Italian coffee from the comfort of your own home." 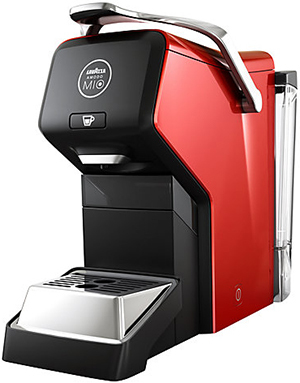 MIELE COFFEE MACHINES - "Built-in & Countertop Coffee Machines." Moccamaster - since 1964. "For the real taste of coffee." All models. Mr. Coffee Coffee Makers - since 1970. All models. NESCAFÉ DOLCE GUSTO - all models. 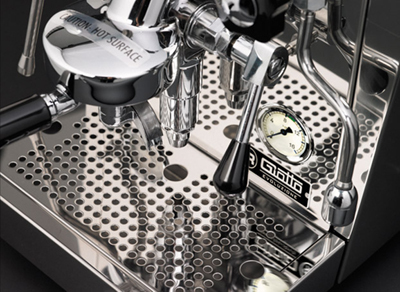 Nuova Simonelli - "The Espresso Extraction Authority." All models. PHILIPS Saeco espresso machines - all models. Pique - "Cold brew coffee in under 10 minutes." RANCILIO - "Coffeeing the world." All models. Ratio Coffee Machine - "Meet Eight." ROCKET ESPRESSO MILANO - all models. ROYAL COFFEE MAKER - vacuum coffee brewers. 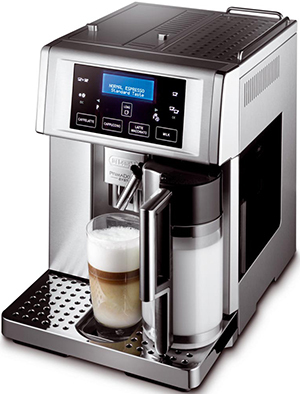 Saeco super-automatic espresso machines - all models. 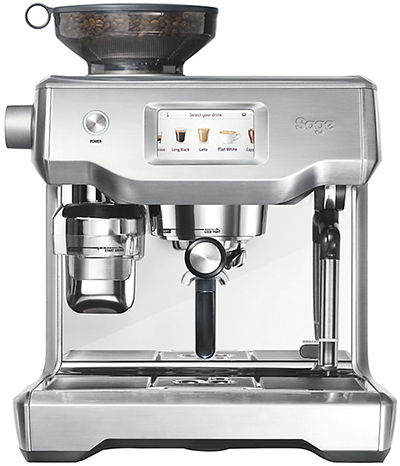 Sage by Heston Blumenthal - espresso machines. All models. Scanomat Top Brewer - A tap and an app. "The TopBrewer is an innovative world novelty that has created an entirely new category within coffee brewers. It turns the common conception of coffee brewing and dispensing completely upside down and its simple sculptural design is breathtaking. This not just a coffee machine." 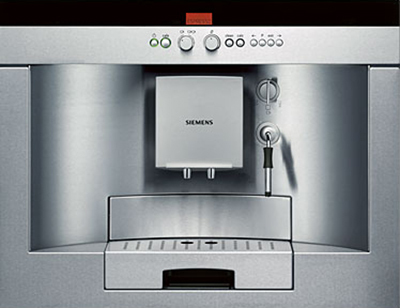 SIEMENS - built-in coffee maker. 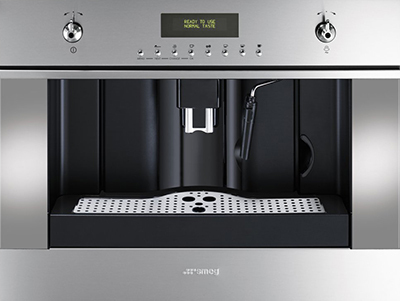 SMEG COFFEE MACHINES - built-in coffee makers. All models. 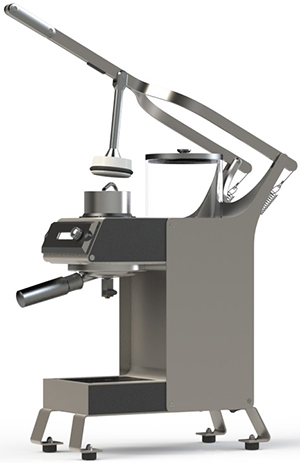 Solis Master 5000 Fully Automatic Espresso & Coffee Center - since 1908. Technivorm-Moccamaster - since 1964. "The world of best filter brewed coffee." Venia Coffee Roasters - Yama coffee syphons. All models.